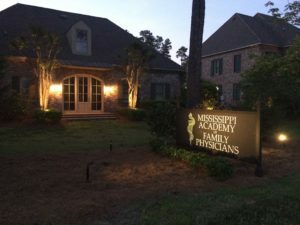 MAFP Headquarters sign lit up at night. The MAFP Foundation has invested in two signs for our building at 755 Avignon Drive in Ridgeland. One sign is visible from the well-traveled Lake Harbour Drive, and it is lit up at night. The other sign is visible from our parking lot. As people pass our building, the MAFP sign creates public awareness of the Academy. The sign also helps set the stage for the identity of the MAFP and MAFP Foundation. We are asking members to “sign on” by making a tax-deductible donation to the MAFP Foundation to help offset the cost of the signs. All donors making a minimum donation of $100 will be recognized here and on a wall plaque in the MAFP Libary. Donations received will also help us purchase more exterior lights. Fully illuminating the building at night will give us a more noticeable presence on Lake Harbour Drive.